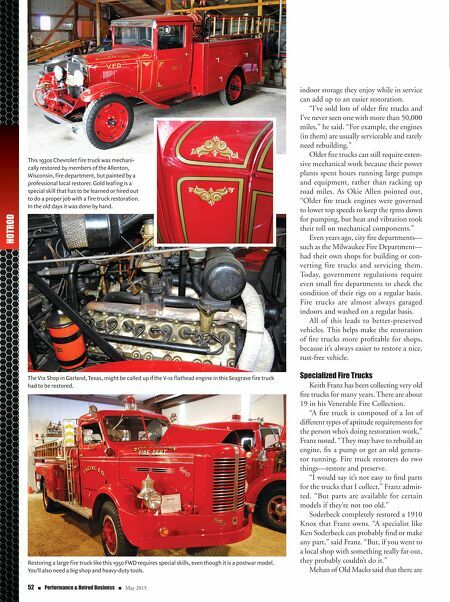 May 2015 n Performance & Hotrod Business n 53 three "old school" fire truck restorers that he recommends to people who buy trucks from him and want to get them restored. "I tell them to call Harvey Eckert at (570) 759-2343 or Cal Little at (717) 566- 8973 if they need restoration work and John Chalmers at (717) 334-8709 if they need parts," he said. "These men don't have email or websites, but they have the skills and parts needed to restore Macks from the teens up." Where to Get Parts? Both Meehan and Soderbeck said that parts for specialized trucks are hard to find. "We have an annual fire truck swap meet in Jackson, Michigan, on the last weekend in April," said Soderbeck. "It's sponsored by the Great Lakes Chapter of SPAAMFAA (www.gliafaa.org) and it is one of the larg- est in the world. There's also a place called the V12 Shop that rebuilds engines and sells parts." The V12 Shop (www.Thev12shop. com) is located in Garland, Texas, and specializes in fixing American LaFrance fire truck engines. The V12 Shop also provides parts, sales and service and res- toration work. Its website says each engine rebuilt is handled with care and, upon completion, exceeds all original manufacturer specifi- cations. All custom machine work is per- formed in-house. D uring a July 2012 tour of Pierce Manufacturing (the world's largest fire truck maker) in Appleton, Wisconsin, Performance & Hotrod Business had the opportunity to visit the company's graphics department. 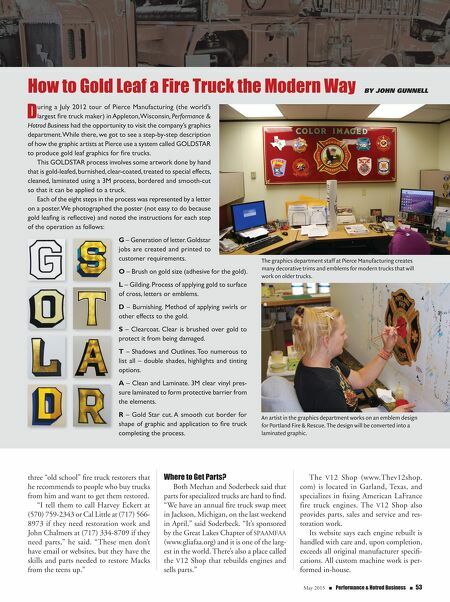 While there, we got to see a step-by-step description of how the graphic artists at Pierce use a system called GOLDSTAR to produce gold leaf graphics for fire trucks. This GOLDSTAR process involves some artwork done by hand that is gold-leafed, burnished, clear-coated, treated to special effects, cleaned, laminated using a 3M process, bordered and smooth-cut so that it can be applied to a truck. Each of the eight steps in the process was represented by a letter on a poster. We photographed the poster (not easy to do because gold leafing is reflective) and noted the instructions for each step of the operation as follows: G – Generation of letter. Goldstar jobs are created and printed to customer requirements. O – Brush on gold size (adhesive for the gold). L – Gilding. Process of applying gold to surface of cross, letters or emblems. D – Burnishing. Method of applying swirls or other effects to the gold. S – Clearcoat. Clear is brushed over gold to protect it from being damaged. T – Shadows and Outlines. Too numerous to list all – double shades, highlights and tinting options. A – Clean and Laminate. 3M clear vinyl pres- sure laminated to form protective barrier from the elements. R – Gold Star cut. A smooth cut border for shape of graphic and application to fire truck completing the process. How to Gold Leaf a Fire Truck the Modern Way By John Gunnell The graphics department staff at Pierce Manufacturing creates many decorative trims and emblems for modern trucks that will work on older trucks. An artist in the graphics department works on an emblem design for Portland Fire & Rescue. The design will be converted into a laminated graphic.